Do you work for Visual Studio Code? "A powerful tool that supports multiple languages"
"Develop web pages and applications with this excellent code editor"
It is software with many features to program in different programming languages, it is quite lightweight and has an excellent debugger, when the best features for me are, the option to refactor my code and also to control git repositories direct and are need to install third-party applications, its interface is dark and excellent to be programming for hours. When managing projects with many files, this editor becomes very slow, it is also difficult to find errors, something I have noticed is that this software has different options in different operating systems. If you are looking for a tool to develop updated and comfortable software this is the ideal one for you, since you will easily adapt to your tools. At work this code editor is very helpful to me since I can configure it to my liking depending on the programming language I use, for me it is very convenient and fast for the creation of web applications. "Best IDE for Coders in Software development - Visual Studio Code"
A full-featured IDE for Coder but it some time lag may be it require a specific amount of Hardware configuration. 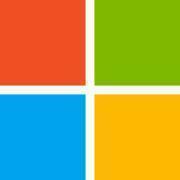 Overall It is great Products by Microsoft. I surely recommend for programmer and designer. Everyone has its own taste with a text editor and IDE. Must try it once, amazing features. I have been using since 1 year. "Smart tool to code quickly and easily." Visual Studio Code has a series of high level tools, it has an intelligent autocomplete with which I can write more comfortably and quickly, its interface is intuitive and very well structured since it has the options in sight, I like this editor a lot because it has a store with accessories with which I can add various functions. This editor can become slow if you install many add-ons, it also takes time to find the syntax errors, in general it is a good editor and has some details that can be repaired over time. Without hard is a tool that every programmer must try since it has excellent options that you will not find elsewhere. "Ultimate Code Editor For Begginers"
I like this code editor because It is very good & fast code editor, If someone start programming so he/she can start their journey with this.User Interface is ultimate. You can comment your code with shortcut key & comment or un-comment code colour attractive, easy to use. I used to another code editor also but this tool is awesome. You can download other programming extension and can be start coding in any language & plugins integration of this tool is good & easy. There is only one thing which is if you install many add-ons & if project size too large it becomes some hanging problem. Although Everything is perfect if system has high configuration. I would like to say to everyone who is beginner or intermediate level use this editor for better response. Visual Studio Code make my life very easy during the company meeting time i am able to show my project updation what is going on in fast way, So that seniors can check my work easily and quick. "Visual Studio Code, or VS Code is one of the best IDE's around at the moment. " VS code is a game changer. As a previous user of Sublime text/VIM who didn't really use IDE's that much, VS code was a pleasant surprise. The biggest hits about VS code is the intellisense code recommendations which basically give suggestions for autocompletion as you type, and also add links to your function definitions and calls, allowing you to take a peek when needed easily. Secondly is the terminal integration which makes development and debugging happen in a single window. There is a bug which causes an open vs code terminal to become garbled or blank when you restart your computer from sleep mode. This would require you to close that terminal and start a new one which would make you lose the previous information on the terminal which might be useful. VS code is the primary IDE used by our lab for all our robotics research. The major benefits are the intellisense system and terminal integration. "It's a light IDE and has all you need to develop web apps"
The plugins integration is good, shortcuts to show or hide windows or having a full screen and an integrated terminal are awesome to have the complete focus on the file you are working on . Also the ability to divide the window in parts to see several files at the same time is cool. Searching for elements is ok but could be better . Having a quick look to the implementation or GIT history is ok but sometimes confusing since it's not appearing. The comparison tool that comes by default is not good enough and sometimes causes confusion. GIT integration is good but I still prefer to use the console. "Perfect Editor for Fast and Agile software development. " One can download/install plugins which are present in the Visual Studio code environment. Some packages are built in and some needs to be installed. The plugins makes development faster and smoother. It is pretty fast and have very rarely experienced any lags/slowdowns. The folder/file structure makes navigation easy around the files. It has several features like looking for a word/text in a file or across a project. Hence looking for files/folders/text in a project is pretty easy and smooth. It has a built in terminal which makes starting/stopping the server and using commands from the command prompt quite easy. It used to crash all of a sudden on Windows 8 version. Though it runs smooth and fast on the newer and current version of Windows or Linux , it wasn't fully compatible with lower versions. Install the necessary plugins according to your need to speed-up the development process. Debugging feature in Visual Studio Code makes debugging applications quite easy. The overall look/theme of Visual Studio Code makes coding quite fun too . Basically it has everything a developer would need to develop an application. I use Visual Studio Code for writing code for the projects assigned by the company. It is used for writing code for the website and apps. VSCode is in Beta. I'm hoping that they develop out of it because I'm a fan of this IDE. Sometimes it does not find the errors quick & in fast way, so for this to find error I have to save the file to be able to notice the errors in my code structure. Sometimes according to the size of the project this editor can become very slow. VSCode is a friendly tool with the help of this I have been able to work comfortably with my clients via remote share my code screen with them since we can manage the repositories with ease, and it is become very useful when it comes to web development. "Visual Studio code for All (supports Linux, Mac, Windows)"
Developed with the help of Electron cross platform js framework for GUI based applications. Easy to use, open source code editor /IDE for lot of opensource and closed source languages. Love to use it with Angular, Node, Python and last but not least C#. It will support major open source programming languages which I like the most. Very good community with lot of community packages. Any one can contribute to new packages or modules. Any one can create their own library and contribute to community. Developer life easy with Git /GitHub integration. Can be integrated with DevOps tools for CI/CD. Can implement end to end applications without other tools support. It has very good community support for extensions. Extend the functionality as needed accomplish your goal with in the time. Some time installing and configuring modules make you confuse, bare with confusion and stick with documentation, Still reach your target just ask community. They will guide to succeed your goal. Easy to use IDE for major platforms like MAC, Windows and Linux as well. Open sourced from Microsoft. Simple power full and most efficient. Great tool/ IDE to go with. Good community support and lot of extensions and modules available for supporting development. "Visual Studio Code - Simple editor but with powerful features"
It is more than a code editor, it allows me to have several files open at the same time, I can also configure it to manage the repositories of git, the advantage of this editor is that I can install add-ons and also has support for many programming languages. It also allows me to refactor code, and debugging is done in the editor, what I like about visual studio code is that I can customize the icons and colors. It can become a very heavy editor if you install many add-ons, since syntax errors are sometimes not highlighted with rapids until the file is saved. It is a totally free editor, it is worth trying them but you should first check if this software has what you need to develop your project. I arrived several years using this code editor to be able to develop all kinds of computer projects, what helps me to work more productively is its autocomplete and the way in which it shows syntax errors. "Source code editor with excellent built-in features"
I have been using this editor for a while and it is very good, it has very good features, its interface is easy to use, it has a very innovative horizontal menu with all its tools, it also has the option to connect with the Git repositories directly without having to download additional add-ons. Sometimes it does not find the errors quickly, so I have to save the file to be able to notice the errors in the syntax, also depending on the size of the project this editor can become very slow. If you are looking for a source code editor with support for the most used programming languages, this is a good option. It is a tool with which I have been able to work comfortably with my colleagues, since we can manage the repositories with ease, and it is also very useful when it comes to web development. "Un editor de código sofisticado"
Me gusta Visual Studio Code porque permite la edición de múltiples códigos de programación de manera sofisticada, hace resaltar la sintaxis de cada lenguaje de programación con tan solo cambiar la extensión del archivo a editar, también posee una función de intellisense que le da la capacidad de predecir la instrucción que estamos por escribir y con esto no hay necesidad de escribir toda la instrucción completa. Otra ventaja que tenemos es que Visual Studio Code no solo se ejecuta bajo Windows sino que también fue creado para Linux y Mac OS permitiendo el alcance del software a una gran cantidad de usuario que no utilizan Windows. los proyectos en visual studio code no se pueden depurar como se hace en un IDE, no tiene la capacidad de gestionar servidores remotos y de pruebas para los proyectos, al iniciar ejecuta subprocesos que consumen mucha CPU, no tiene la capacidad para programar y visualizar paginas web en tiempo real. con visual studio code se realizo la pagina de la empresa y con el diseñamos las paginas y aplicaciones web para nuestros clientes. 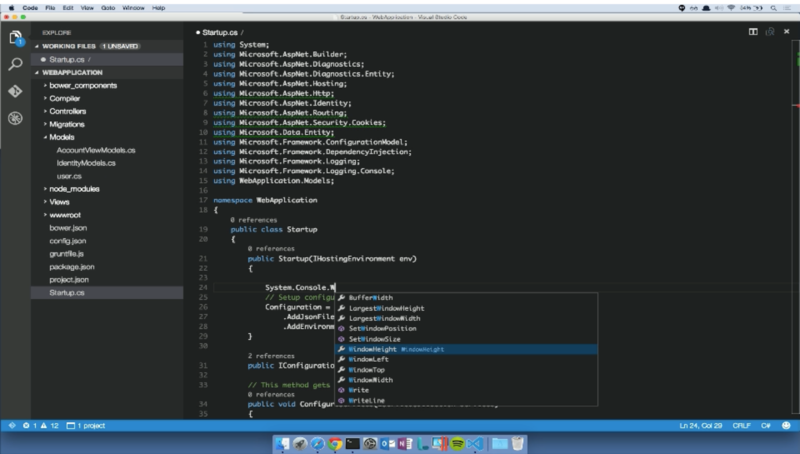 "Visual Studio Code, just awesome." I have been programming for many years, even before graduating and finding a job, and I have tried many code or IDE editors, for a long time it was constantly changing until this publisher was tested when they finally released it for Linux. Nothing else open it for the first time surprised me visually beautiful of its theme and sources, this is something that unfortunately in Linux is not seen often, applications with UX / UI updated and beautiful. Another thing that I liked was the way to implement VScode Git, very simple but with all the options I needed to use. Technically the application behaves very stable in general, except for some other crasheo that I have suffered when opening large projects. Finally, the application has a great rhythm of updates to add new features or correct bugs which is appreciated compared to others that update very slowly. - Should offer support for more programming languages by default, or at least the best known. - Greater quality control over the plugins offered by the community, I had to try several plugins so that VScode supports php autocompletion correctly. I recommend using VScode, especially if you are one of those, like me, who refused to use the application because it is Microsoft, the application is really excellent and if you still do not trust you can check the code of the application in Github as it is released. I needed a code editor in which I could not just program if I did not edit simple text files. I was also looking for an application with well-implemented Git support. Visual Studio Code has satisfied all my needs. Lightweight, a lot of plugins, open source, delicate but robust. Pretty much stable, adoption by a lot of people. Cool shortcuts, multi platform, very powerful IDE but very decent UI and easy to use and improve with plugins. Comes with a terminal! Cool! This tabs mode for opened files, cool! I now use it for my everyday task with plain text files regardless of the language. I use it for developing a back end in node.js with swagger plugin, and an Angular front end. Also I use it to develop a mobile app in IONIC 4 so it's pretty cool all the links between files and classes, the auto completion for functions and variables work as expected. On the left side of your display you find all this cool sections about your tree project, source code status, oh right! you can commit and push your files with ease! the find and replace feature works as expected, pretty fast for large files, like json or CSV files that I have to work to. 100% recommended. Pretty much nothing. I love the simplicity of the UI and the way they handle files. Just use it for a couple of days and you going to start loving it. I use it to develop in node.js, Angular. Handle GIT in a very great way. We have this plugins for formatting css, js, html , etc files. We just love it. "Good text editor for developing Java Script"
Even if it has bunch of plugins, sometimes it gets difficult to find the right kind of plugin which can help you. Although this is not something you cannot deal with. Apart from it, there is not much which I dislike about. If you want to develop application using java script and you are not sure which IDE/editor to use then this is the best editor to start with. It is very easy to use and get used to it. I have been using this editor for developing web application in Angular framework. It helps me in developing application faster and better. "The Code Editor for Development perfect on the market." - It is possible to create applications using C #, C ++, VB.net, and more. - It has an advanced code debugger. - It has autocomplete code. - Manage queries towards SQLserver. -The project manager and code is very well dustributed. VS Code is super easy to use. if you use a code editor, then consider looking at VSCode. It is also tottaly free so you won't lose anything trying it. "It's perfect for web development"
It is totally free and is ideal for web development although it is also excellent for programming desktop applications. The preset functions are more than enough to start any type of project. It's a bit heavy, so I recommend having good ram memory. The interface is simple but that can be solved by installing visual themes. 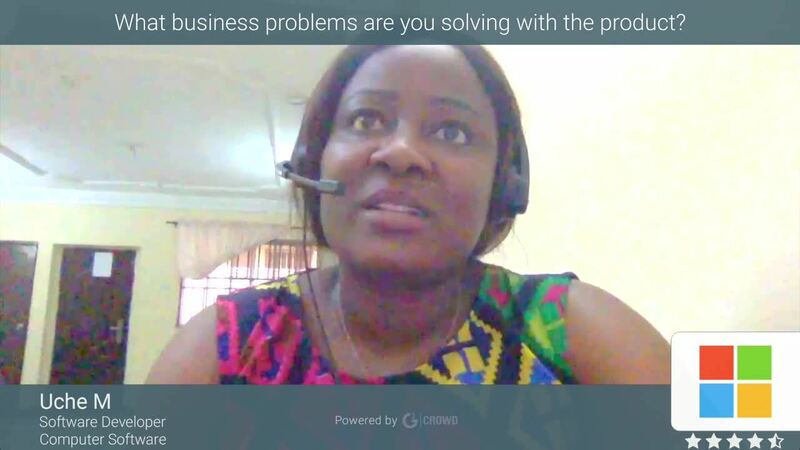 I recommend this software extensively, it has a high degree of customization and this makes this software very scalable. Actually I have not had any problems with Visual Studio Code and it has become my main IDE to edit code. This software is the preferred one in the development department in the company in which I am working, it is very simple and it is not necessary to be training personnel to be able to use it. It is very versatile since you can extend its functions by installing themes. "One of the best editors I have used yet!!" There are so many things that I like about VSCode. They have an amazing built in debugger for starters. The editor is also extremely useful for helping identify errors in other less obvious places in your code. They highlight areas that are missing and give helpful notes when writing methods or using reserved words to save you the time of googling those same options. Their package manager is by far the most intuitive I have used. I began by using sublime, later switched to Brackets and finally ended up choosing VSCode due to its far superior product. Only a step below WebStorm, BUT IT'S FREE!!! One thing I don't love about it is that sometimes the pop up notes interfere with reading the code above or below the code that I am writing. It can be very distracting at times, however, I definitely see the merit in using it. I wish there were perhaps a way to select which things it would show up for and which things it would stay hidden for. GET IT!! It's worth the learning curve of getting a new text editor, procrastinate no longer!! Well we teach web development to dozens of students. So it is solving our need for an efficient organized editor to use in our classrooms. The best! "VSCode is lighter and more powerful than many IDE"
We loved Visual Studio code in the office, and many of us have started to use it as the default editor and to program. Personally, I have started using it both at work and at home. I was surprised at how light it is and the few resources it uses and everything it offers in return, it simply does more with less and better than the competition. I've been using it for more than 16 months and one of the things I liked most is how nice and clean its interface is, not many editors look so good by default, so I have not wasted my time trying to improve it because it seemed perfect to me. Visual Studio Code implements by default Git and does it very well, making commits was never so pleasant! The autocomplete is also excellent, although it does not include autocomplete for all the languages it can be added through plugins. The plugins is another strong point of VSC there are many and their quality control is very good. We also have the configuration, which is done through a configuration file (very well organized and documented) and that it is possible to share with other users of your team or with yourself in different computers. And it also support linux which personally i liked so much because is my main OS at home. At the beginning I was reluctant to use VSC, however much I was recommended. After trying it you can not live without it and you will become your default code editor. It is an editor with which I can write my code without problems and is compatible with almost any programming language, has integrations that facilitate work, it is also lightweight and I can run it on almost any operating system, plus something I like is that I can download Excensions of which the majority are free. Sometimes, depending on the number of files that run, it can freeze, I also find it difficult to adapt to its interface because it is very different from what I was using before. Is a current and innovative tool that you should not stop using since it will help you a lot in your work and even more if you are software developers. It helps me to be able to edit my code on almost any computer, since this editor does not require computers with high performance to run, it also helps me to work with git without problems and without having to make difficult configurations. "VS Code a sensational open source editor." It is a great text editor, full of so many surprises when you use it for the first time, your workspace is so complete that you can complement it with its additional extensions, its compilation engine makes each integration or blocks of codes process them immediately. You can have a great view of your code, of your sites or folders in which you store your projects. It's been a long time since I felt so comfortable in a text editor that with VS Code I could find. As far as I'm concerned, I have nothing to add, your community cooperates daily to improve this tool and it has worked perfectly in every deployment I have made with my team. Even when I have been offering some induction I recommend the use of this tool, it is really fantastic. Personally I had and experience with this application so I really recommend it, you will not regret using each of the options that you can offer. I currently use VS Code to provide programming classes within the institute where I teach classes and additionally I do freelancer work in which I develop web business systems, web sites and web applications. The guarantee that I have with a manager that has everything I need is impressive, even when I include Git to keep the version control of my projects with other colleagues works perfectly. I have a series of extensions that help me at all to convert my workspace into a whole comfort area. "Visual Studio Code, A Great All-Purpose Code Solution"
I think it could have better Java and C++ support for autocompletion and debugging. Very often, I don't know there is a problem until I go to compile which slows me down. Many tell me to use other IDEs for these languages but I honestly just like using Visual Studio. Use Google to find out the extensions that you need for your project. I keep everything in one place. Many different files across different languages. The built in terminal is very easy to use. There are so many extensions that can be installed to improve your workflow. I often build applications in Max/MSP that rely on external code. I keep VS open with all the relevant files and I am able to easily make updates or changes and see them immediately work in Max. "powerful, comprehensive, fast and light-weighted IDE"
I am a Java developer and before migrating to Visual Studio Code I was working with Eclipse and Intellij, both of which are really good IDE for Java. The key point I think help vs code be a even better tool is that vs code is a light-weighted version vs, remaining covering almost every popular programming languages and presenting various libs and tools contributed by developers, but running even more stable and smoothly than Visual Studio. It's hard to say vs code has some downsides but maybe the delay after keyboard input and cursor move could be kind of annoying. Fortunately it doesn't happen that frequently so I still can bear with that. VS Code is a versatile and powerful IDE for cross-platform and multi-languages environment, inheriting almost all key advantages from VS and running stable and fast. I use vs code to do my Java and C++ projects everyday. The benefit, as I mentioned before, is that vs code is so comprehensive that I don't have to change IDE to work with different languages. "Good IDE for multiple programming languages in single project." Visual studio code is a very good IDE which recently anaconda provided support of.It is very usefull especially while working with django project which requires html, css and python files to be viewed and edited at the same time to check the updates in real time of the project.The best thing about this is that you get console in the same window from where you can start the backend server also.It also has multiple environment setup options. Nope it is all good IDE as per my requirement. A good IDE for coding environement and it is open source product and one of the finest IDE by microsoft.It serves all the purpose of working on live project and manipulating multiple files with different programming languages at once.So I say that you should shift to visual studio code because it is no doubt the best IDE. I am using visual studio code as my primary IDE for development and according to me it has many benefits like I can have python and html file opened at the same time in same project so that I can make dependent changes in both the files.It supports almost all programming languages. "Awesome Code Editor with Best Feature"
As Visual studio code has great feature & best IDE editor so I will suggest to my friends & colleague to use this tool to their development. In our organization we use to code multiple files & multiple project so we use visual editor it will support multiple window & split tabs so we can write the code simultaneously. It is solving our problem of concurrent coding. visual studio code gives us many benefits because its free of cost so its giving our organization to growth very rapidly.it is very powerful IDE so we can developed many project using this. "Very powerful and rich IDE"
It is very powerful and easy to use IDE.This is best editor.It is very light.It is very versatile , fast and easy to install and very easy to learn. You are using GIT in developing and conflict resolve option is most likely to having in this editor , it is easy to resolve conflict in this editor. Visual studio code gives great amount of customization for developing purpose, It is quite difficult for developers who don't know very well to understand and get very well. The shortcut key interface for keyboard commands is very unobtainable and really mixed up.Sometimes some extensions get buggy and fail on startup of IDE and I have to restart it. I am recommending every developers and company heads to use this IDE, It is really good. I can work on multiple coding files by splitting the editor in two tabs as opposed to having different windows open and it is very useful.There are many plugins and extensions available in this IDE. "An editor for all type of Development." Its very lightweight and power packed editor. Visual studio code offers a great range of extensions for whatever development you are doing, through the extension manager you can install numerous useful extensions. VS Code is very fast, it hardly takes any time to load on windows compared to other editors. Themes are also available. Its git integration is very useful and is something i use the most. Performance is quite lagging at time, since Visual studio code offers great amount of customization, its quite difficult for newbies to understand them all. I also feel its quite expensive compared to other editors. Database integrated projects are quite difficult to develop on VS code.It uses quite a lot of RAM. Try using as many extensions as possible, they are very helpful. Don't install extensions which you don't use, its will make your start up of Visual Studio Code slower. Try deploy reloaded if you work on remote machines. I use it to develop small and large projects. 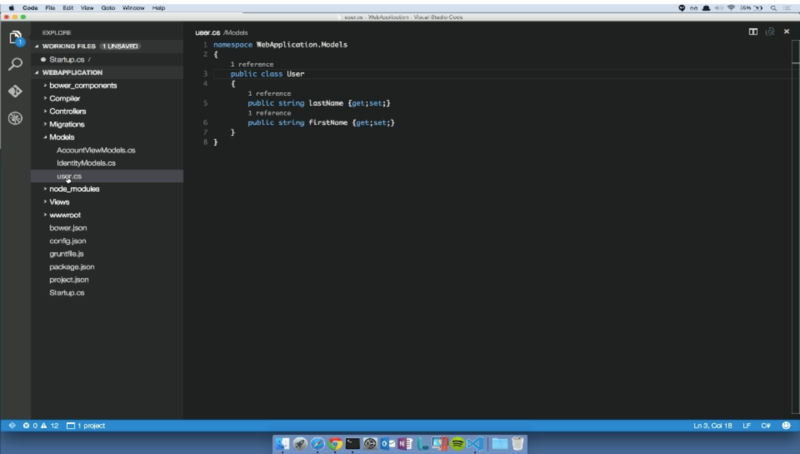 "Love Visual Studio code for all types of coding"
I like the style and design the best. It's easy to look at and tab through many codes that I have open. The debugging tools and stylish tools are helpful in making clean and efficient code. It is black with neon text which makes it easy on the eyes at all times of day. I dislike how cpu intensive it is. VS code can be very draining on my laptop battery. I find that I can only run VS code for a couple hours and that it overheats my laptop. I would highly recommend VS code! It has helped me in languages such as Java, C, C++, and Python. If you're a student, young professional or just looking for a new way to code I would recommend VS code. Works well with my mac book pro and with my Dell desktop. I have github integrated as well to have more collaborative coding. "Visual Studio Code is the ultimate text editor for website development"
I love how VScode nailed the important main features of being a great text editor. Their plugin library is well thought out and has a great open source community. The built-in git support and terminal makes the application useful when tracking merges on larger projects. VScode also offers a really great UI that runs fast and without bugs on any platform. I dislike the keyboard commands mostly. They are much harder to remember and don't make much sense for the hands compared to apps like Sublime Text. The interface for keyboard commands is also horrible and really mixed up. This system could be improved a lot in the future. If you are considering VS code you should definitely take the leap and focus on it. It's industry standard software that most great website developers use today. You can download sublime text and run it next to vscode to see what you are missing as a consumer and why people are switching to VScode every day. Visual Studio Code is my daily code editor and helps solve the problem of writing code efficiently. There are huge benefits to being able to program application efficiently for my clients. I have realized that having a great set of tools in one spot with a seamless UI makes your experience as a developer more pleasant. "A relatively lightweight Microsoft publisher"
With Visual studio code, I can encode my projects more productively, since it has a real-time debugger and also allows me to split the screen to open several files, the other advantage of this editor is that I can download add-ons in a way Very easy and without the need for difficult configurations. At the beginning it was difficult for me to configure the code debugger as other tools of this editor, also keep in mind that, when installing certain add-ons and functions I can become slower. This software is quite light and easy to use, I recommend it since it is very good for web development and applications. This is a new tool, with which I have been able to work more comfortably with my colleagues, because it has an integrated git command, which is very useful for working together. "Free and Powerful! Visual Studio Code has finally replaced all my external code editors!" Its a very easy to use and powerful development tool for all platforms. 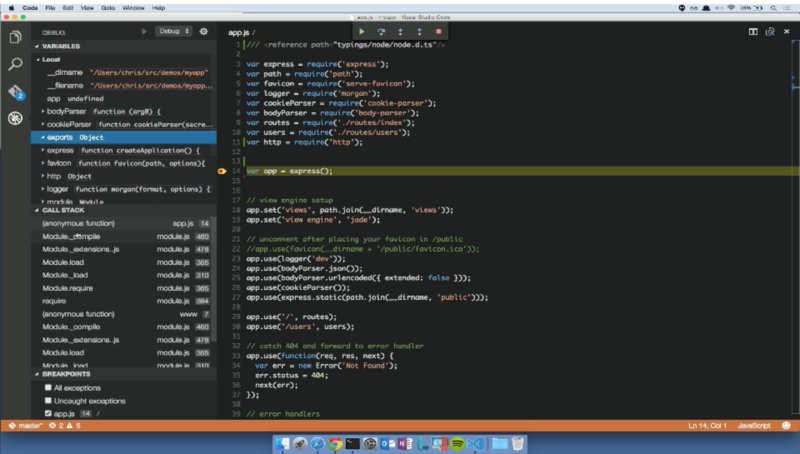 Whether you are running on Mac, PC, or Linux, you can use Visual Studio Code. Its great when you need to edit a file on a PC but don't want to get involved in having to load a big tool like Visual Studio Enterprise. For open source projects its an essential. It replaced Notepad, SlickEdit, and Sublime on all my machines! I use it daily and often and it provides me a slick clean and frequently updated interface for doing all my coding outside of Visual Studio. GREAT for HTML editing on the fly too! Cant wait to use even more of it's features such as GIT integration in the next open source project I have. Once extensions for it blossom this will be even more of a killer tool. I wish it had a few more features of its big brother such as code completion. Its a bit hard to configure settings for since it is a config file instead of a UI editor. Other than that, for what it does for FREE and cross platform. You cant knock it. Take some classes on Pluralsight on how to best get into using this and install this bad boy on all your boxes! Quick and dirty code editing when a Visual Studio or other big development environment is not needed. Its benefit is that it has replaced most of the other editors I used to purchase! "A light and practical development environment to encode what you want." It has a plugin store in the same editor, you can also configure your debugger to find the errors of the programming language you want, something I like about this code editor is its interface since it is very compact and has all the tools I need for the development of applications and web pages. The configurations of certain tools are somewhat complex, in addition to executing projects that have a large number of files this becomes somewhat slow. It is a free editor and with excellent benefits for any software developer, I recommend it. In my work this code editor is very helpful because it allows me to work comfortably and quickly, it has tools that other editors do not have, either as the Git commands, which are very helpful for me because I can manage the repositories easily. While I was skeptical at first given that it was a free Microsoft product, I have been extremely happy with VS Code, specifically for NodeJS development. The built-in debugging capabilities along with the rich selection of high-quality third-party extensions (looking at you vim keybindings!) make this editor a pleasure to use. As I mentioned, I primarily use it for NodeJS development, but I still continue to use other tools for other languages. I just haven't found any of the other language support to be nearly up to par. This is partly due to the reliance on third-party extensions for multi-language support. Give it about a week and you'll learn to love it too! "Super versatile editor for all your coding needs"
I like a lot of things about Code. It is VERY customizable. There are a huge number of extensions out there or you can write your own. Being able to write scripts that customize the editor allow you to optimize/speed up your own processes and tailor the editor to the way you like to work, either by simply adding color coding to the code you're writing or even adding your own shortcodes for tasks you do frequently or repeatedly. The sheer number of options and commands the editor supports can be a little overwhelming and are not exactly intuitive. I have to have a number of cheatsheets on hand depending on what I'm working on, so I can do what I need. But I don't really know how else to incorporate so much functionality, so this is not necessarily a bad thing, it's just a matter of getting used to it. It's not a beginner's editor. It's very powerful, but the learning curve to use it well can be steep. Worth learning, though. "Switched from Atom and never looked back!" Everything! This is not an over exaggeration. I work directly on my laptop more than I do with it hooked up to two monitors and I'm not a huge fan of using the split screen on my Macbook. I bring this up because I used to have to keep a separate terminal window open or use an Atom package that didn't always work. So I love that VSCode came with an integrated terminal and that I can set it up to use what ever shell I prefer. There's honestly not much if anything I can think of to dislike about VSCode. Sometimes some extensions get buggy and fail on startup but I believe that's more to do with the extension than VSCode. I've mostly experienced this problem with the Live Server plugin. Find extensions that will make your workflow easier depending on the type of programming you do. I recommend Bracket Pair Colorizer and indent-rainbow. Also, I'd highly recommend the Settings Sync extension so you can save your VSCode settings (including all your extensions) to a Github Gist. This way you'll have access to your setting even if you're using VSCode on a different computer. I'm able to work faster by having my sites live reload in the browser as I make changes. I'm able to distinguish different file types by using file icons that or aesthetically pleasing while still being concise. I can work on multiple files by splitting the editor tabs as opposed to having different windows open. The major problem solver for me is the integrated terminal. I spend a lot of my time working in the terminal because it's time consuming for me to use GUI to add folder, files, etc and also run Git commands. I install npm packages for different projects as well as install applications using Homebrew so it's nice to not need to switch screens or reduce my screen real estate just to use the terminal.